These are questions which many people—many Christians—struggle to honestly answer, queries which have caused people to walk away from the Christian faith, problems that have eroded many hearts and minds. And, lest we be seen as overly dismissive, these are significant and important questions, questions which need understanding and (when possible) answers. To help us think through such questions, Joshua Ryan Butler has written The Skeletons in God’s Closet: The Mercy of Hell, the Surprise of Judgment, the Hope of Holy War (Nashville: Thomas Nelson: 2014). 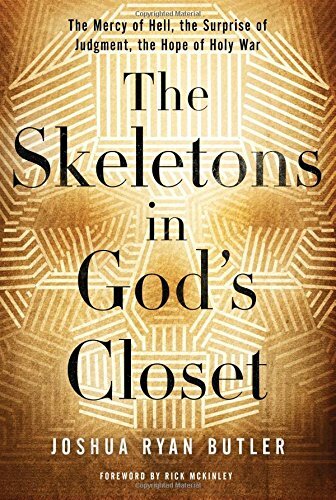 This important work is set up as a consideration of the “skeletons” –the difficult and dark doctrines–in God’s closet, those topics which many contemporary Christians are uncomfortable talking about or dealing with. The reflections of this book are deeply personal for Butler, who recounts on numerous occasions his own wrestling with these questions, as well as his interactions and conversations with others struggling to understand hell, judgment, and holy war. From the start, Butler advocates two major steps to address these complex issues: first, the need to confront caricatures. That is, we need to stop accepting, uncritically, the presentation of God that is offered by culture (and even some Christians) and engage the scriptures. In a complex world we cannot afford to accept simplistic interpretations and presentation of reality. This means that Christians need to stop reading the Bible as an instruction manual and begin (or rather, return) to reading it as God’s story of the bigger picture of humanity. Second, when thinking about these issues we need to recognize that God is good. Butler casts this as the central message of the Bible, the “thesis” by which all other interpretation and theologizing must be done. By reading the Bible in light of God’s total goodness, our understanding of hell, judgment, and holy war can radically change. 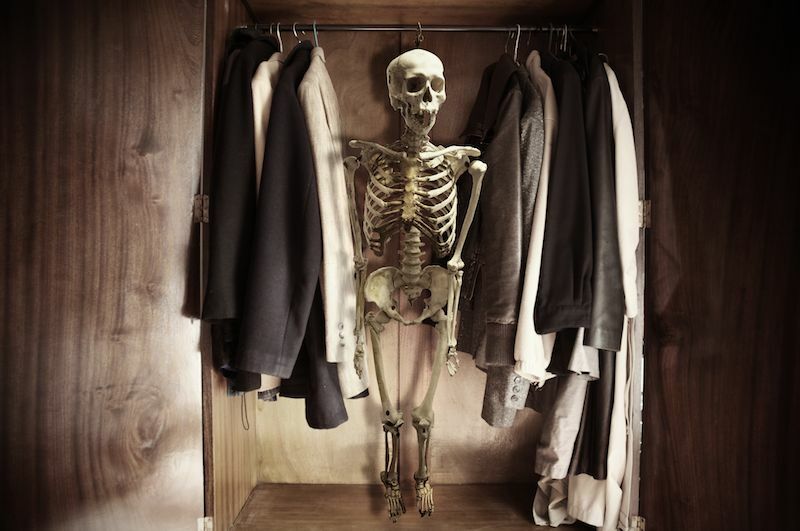 The Skeletons in God’s Closet is divided into three sections: the Mercy of Hell, the Surprise of Judgment, and the Hope of Holy War. Each section offers an introduction to the problem being considered, a contextualization of that issue in the Biblical narrative, and a recasting of the issue, Butler’s explanations of hell, judgment, and holy war in light of God’s goodness and the reality of human sinfulness. Especially useful are the “Key Idea” summaries at the end of each chapter, which would be great tools for a small group encounter with this book. There is also a helpful “Loose Ends” Q&A section at the end of the book which offers some specific reflections on questions alluded to but not expressly dealt with in the main body of this book. Butler’s discussion of the terms that are used in the Bible to describe hell—Gehenna and Sheol— constitutes (in my mind, at least) an important step in properly understanding the Biblical portrait and meaning of hell. In the section on hell, Butler does a fine job of wedding the Biblical narrative of God’s defeat of evil, contemporary concerns with evil and justice, and the insights of Christians who have gone before us concerning hell. Butler does not shy away from the difficult questions (and implications) of hell, but engages tough questions with clarity and insight. The section on judgment primarily takes an approach of intra-Christian judgment, reminding readers that “religion is no safe place to hide from God” and that Christians are called to a higher standard of righteousness. In this section Butler tackles the difficult question, “What about people who have never heard of Christ?” In his answer, Butler notes that God’s judgment always begins with his own people and argues that “accepting Jesus” really is not the goal of the Christian life. Rather, God calls all people to union with Him through Christ, desiring that all people be granted the freedom to lovingly serve humanity, especially those less fortunate than ourselves. While there is much thought-provoking material in this section, I was sometimes unsure of precisely what Butler was calling his readers to do through his balance of Christian love and judgment. His difference emphases on how to deal with people inside and outside the Church left major questions in my mind about the role of Christians in culture, to say nothing of culture building. Things become especially muddled in his reflections on other world religions, where Butler would have done well to employ the idea of “worldview” as a lens by which to shape his reflections. While an admittedly difficult topic, the relationship of the “other” (culture, religion, people) and Christian remains an important one in the “big picture” of Christian faith that Butler is trying to bring to our attention. The final section—on Holy War—does an excellent job of situating the Bible and Christianity within their respective historical contexts, both explaining Ancient Near East rhetorical strategies and helpfully problematizing contemporary empire-building and exploitation. Though there are better resources available to address each of these points, Butler does an admirable job painting the broad picture of how Christians should think about Holy War. The reading of Revelation that locates Babylon and the anti-Christ within the modern global economy is interesting, but in final review is not very convincing from an interpretive standpoint, although Butler’s willingness to question the status quo of American Christianity remains valuable. His admonition to remember that Christ will reconcile and redeem the world is a stark reminder that things are not as they should be in our world. Butler concludes with some reflections on resurrection, a fitting end to his consideration of questions concerning hell, judgment, and holy war in the “big picture” context of the Christian faith. Butler does a fine job throughout Skeletons drawing on the scriptures and writings of C. S. Lewis. 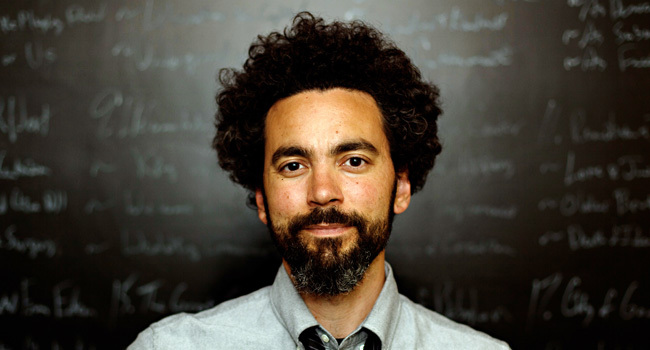 And in his chapter “Ancient or New”, he admirably connects his reflections on the question of hell with early Christian theologians such as Augustine, Athanasius, and Irenaeus. For the duration of this book, however, Butler’s connection to the Christian past is severely lacking. Apart from occasional references to Lewis and Augustine (both of whom I love dearly) or a contemporary writer (Alister McGrath and David Bentley Hart are two examples), Butler effectively indicates that he is the first Christian to approach these questions—important and difficult as they are—within the first 2,000 years of the Christian faith, something which is absolutely not true. Further reliance upon and reference to the answers of the Great Christian Tradition would only make this book better. The Skeletons in God’s Closet is a genuinely helpful book for those struggling with the difficult topics of hell, judgment, and holy war. The emphasis on the world’s need for genuine, sacrificial, and charitable Christian love stands as an important reminder of the Christian mission in today’s context. There is a ton of information in this book worthy of our reflection and application. For this reason, I recommend this book for those encountering questions about hell, judgment, and holy war, and would encourage the use of this book in a small group setting. We all have questions about our faith, and The Skeletons in God’s Closet: The Mercy of Hell, the Surprise of Judgment, the Hope of Holy War can be an excellent tool for thinking through those questions. I received this book from Thomas Nelson Publishers in exchange for my honest review. All opinions expressed are my own.